Please note that this tutorial is about connecting Dialogflow agent to outbound calls, If you need to connect inbound calls to your Dialogflow agent please follow the "How To Use Dialogflow Connector" tutorial. Recently Google has introduced Google Duplex, it's not based on Dialogflow, but you still can build something similar using Dialogflow Connector and Voximplant. Dialogflow Connector lets connect a call running via Voximplant to a Dialogflow agent, which will do speech recognition, natural language processing (NLP) and speech synthesis according to its logic. Audio streaming from Voximplant to and from Dialogflow happens in real-time, query results arrive to VoxEngine as soon as they are returned by an agent. It's required that Dialogflow agent should be setup to support API V2 (since API V1 doesn't support streaming) and Beta features should be enabled (Settings -> Enable beta features and APIs) , since speech synthesis is in the beta features list at the moment. Re-check that your Dialogflow agent uses API V2. Now create and download the service account JSON file associated with the agent from GCP console (please read the Setting up authentication article for details). "Dialogflow API Client" role should be chosen while creating the service account. The JSON file is required for Voximplant to be authorized before sending audio data to the agent. Click on the Speech tab in the agent settings to setup Speech synthesis options. Enable Automatic Text to Speech by clicking on the toggle button, choose MP3 or OGG in the Output Audio Encoding dropdown (IMPORTANT: only MP3 and OGG are currently supported) and one of the available voices - we highly recommend to use WaveNet-powered voices, since they sound much better than standard ones. Save settings by clicking the Save button in the top right corner. In Voximplant control panel go to your application and switch to the Dialogflow connector tab. Here, click Add in the center of the screen or Add Dialogflow agent in the upper right corner. You can also use visit Marketplace in the main menu to deploy an application and a test phone number that will be connected to your Dialogflow agent – to do so, click Install in the appropriate tile. 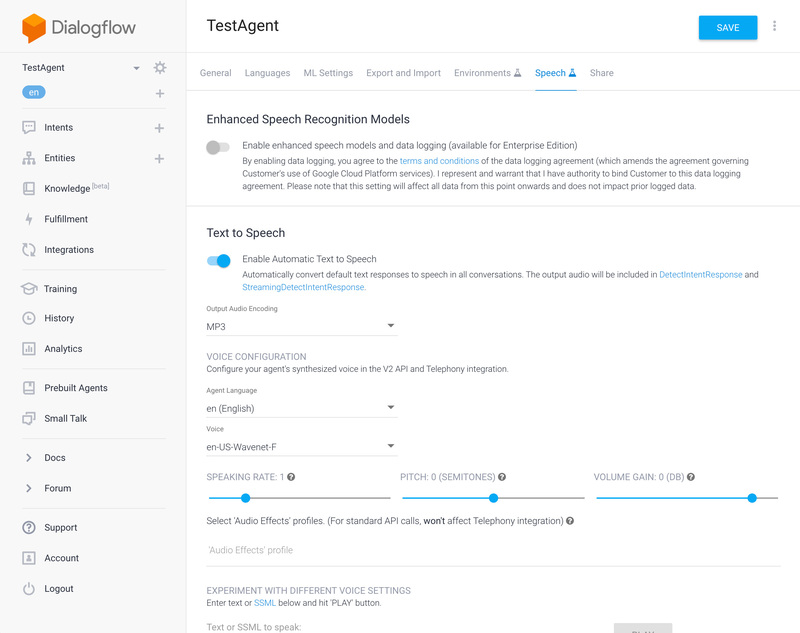 Then follow the instructions to do a test call and be connected to the Dialogflow agent. IMPORTANT: If something went wrong it could be required to delete the test application in the Applications section and the test scenario in the Scenarios section of the control panel before you try to create the test application again. Their names start with DF_ (for scenarios) or df- (for applications). Please note that default test application can work with an agent that supports English language, if your Dialogflow agent uses another language please change the test Voxengine scenario accordingly. To make calls to phone network from Voximplant real phone number is required, since it will be used as a caller ID. On the Voximplant control panel, select Number on the left menu and then select Buy new phone number in the upper left corner. The phone number interface will be displayed. Select Test numbers, select one or more virtual numbers and click Buy selected. After you’ve bought a number, you'll immediately see this number on the list. If you've chosen the number in the country where no special verification is required (for example, in The United States) then you will be able to make calls now, otherwise there will be a requirement to upload verification documents required by authorities in the country. It will take some time until the number becomes active if all the submitted verification documents are correct. If everything was done correctly, the call will arrive to the specified phone number and you will hear a greeting from your agent. If you want to initiate a call programmatically you need to use the StartScenarios method of HTTP API. You can also use Voximplan't CallLists if you need to initiate many calls.